Do you know about Microsoft Office 365 common issues? Let's read this article aware of Office 365 knows issues. Are You Aware Of Microsoft Office 365 Known Issues? Do you ever get an error while using the Office 365 application? If no, so, you are at the right place to being aware in advance its common issues. Office 365 is prominently used email client all over the globe. Mainly, it provides satisfactory and useful features to the professionals. It facilitates features like data security and control, having larger mailbox storage, no licensing mess and much more. But, we all know one thing i.e., if you get something good so, there is something bad is hidden. Overall Office 365 is an amazing application. But, sometimes users may confront some issues. 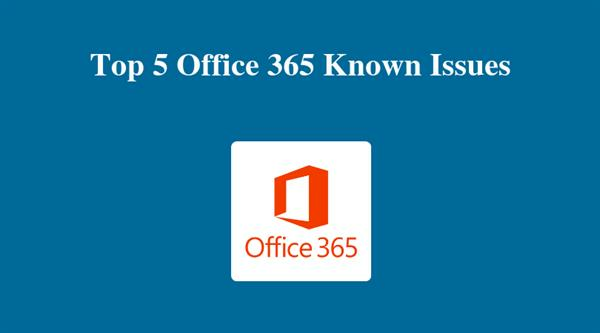 So, in this article, we are going to tell you the top 5 Office 365 known issues. Go through the entire write-up to learn more. Microsoft Office 365 sign in problems. Unable to stop Excel, Word, and PowerPoint from opening files in the same window. O365 synchronizing issues in Outlook mobile & Outlook Mail. Office 365 unable edit problems. Office 365 cannot upgrade problem. Office 365 has a downside also. Here, in this segment, we are going to discuss the issues of Office 365 in an appropriate manner. Restricted control over the execution may lead to the occurrence in performance issues. by definition that's a considerable Office 365 problem. By default, Microsoft guarantees 99.9% of Office 365 uptime and supports the guarantee with a financially backed service level agreement. Hence, if a customer’s monthly uptime is less than this percent, Microsoft pledges to compensate the gap with the help of service credits. This sounds reassuring, indeed. Moreover, real scenarios prove that performance issues with your Office 365 solution are still possible. All things are considered, it all says that the organizations require to have an alternative to face potential Office 365 downtimes. Let’s remark if cooperation interruption is inappropriate, it’s reasonable to have a subsidiary communication medium to stay available in case of reinforcement. Users who have auto-reply settings like vacation messages etc., configured for their email when they are transferred to another server may have unpredictable behavior after completion of the migration. For instance, auto-reply settings that are programmed to expire might be continued after the expiry date or time. Should this problem occurs to users may resolve it with the help of the provided option of auto-reply on/off by the Outlook Web App in order to upgrade the setting. Thus, another email settings may not be conveyed over properly during the migration procedure so, it is better to check all your personalization after conversion. If you recently updated to Microsoft Office 365 and consequently upgraded your Windows 10 Operating System. So, you may notice some issues with the office suite. The current method for this scenario is to remove and reinstall the office suite after you will successfully be updating the operating system. You may also require to delete the license for that workstation and permit it to be regenerated after the fresh installation. Security is the main and core requirement for any user. But, still, security is the prime reason for companies to postpone their cloud venture. While MS facilitates multi-skilled Office 365 security ensured via physical protection, in-built security functionalities, and customer controls, organizations are fearful all the time to lose their crucial data stored in the cloud. Security concerns are among Office 365 issues. Usually, Office 365 is a prime target for cybercriminals who implement the inappropriate activities to disrupt particular deployments. Exchange Online still the most prominent target for hackers who search for stealing important and valuable corporate information and private data from subscribers emails messages. To ignore security problems, Office 365 administrator should have to monitor their deployments with the help of Office 365 security center. Mainly, they have to keep their eyes strictly on data sharing and users activities. They have to pay specific attention to access controls and user permissions to avoid third-parties from reaching confidential data and ensure employees follow device security policies simultaneously. Microsoft provides Office 365 application and it is physically hosted in Microsoft Datacenters. Those are approachable to authorized Microsoft professionals only. Microsoft also makes sure that the overall Office 365 support and preserved properly. For instance, if you confronting some issues in performance workflow, you will have to contact MS support for this. Their response can take too much time, so you are unable to repair that error instantly. Furthermore, Microsoft takes a decision to introduce upgrades and launch efficient features. The ownership problem is among prior cause for companies to choose for hybrid deployments that permits them to advantages from cloud association proficiencies along with holding control over the on-premises portion of the deployment.